Made by ASP, the Kwik Key handcuff key has several design innovations to produce the best consistent performance. Made of stainless steel, the Kwik Keys are precision machined for universal fit and heat treated for strength. The Backset Tab facitlitates rapid location of the keyway, even in the dark. All models have pin on opposite end. 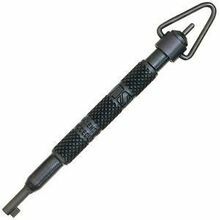 Model 56252 is the barrel version with keyring swivel. The S2 #56253 version has a rubber coated middle. Note: These do not work on 2 or 3 pawl cuffs. Also will not work on ASP model 400 cuffs.